Birthday boy Casey Stoner reckons his bid for a third straight home win in Australia will depend on him finding crucial rear grip after he ended opening practice in second place. 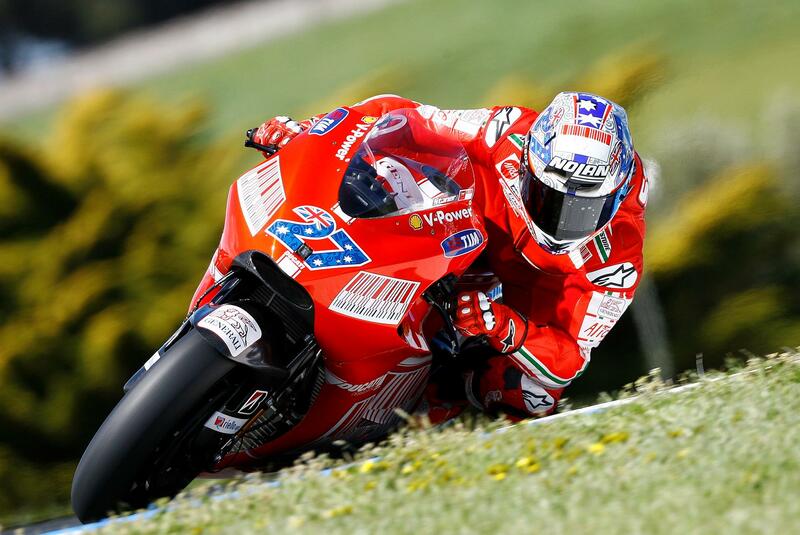 Celebrating his 24th birthday, the factory Ducati rider logged a best time of 1.31.167 to finish just 0.135s off Fiat Yamaha rider Valentino Rossi’s fastest pace. Heavy overnight rain and torrential downpours earlier this week severely affected grip levels at the Phillip Island circuit today, with Stoner rating track conditions as the worst he’s ever seen at the spectacular coastal circuit. The 2007 world champion said: “The track was pretty greasy today and probably the worst condition I've seen this track in. "It was very, very unpredictable and very, very slick, so I don't know what they have been running around here but it is definitely the worst condition I've seen it by far." Stoner said the conditions had contributed to the rear grip issues that he felt hampered his pace as he looks to build on his stunning second place in Estoril earlier this month. He added: ““I’m reasonably happy but I am struggling a little with rear grip like everyone. Its a small problem that we e have to fix. "The bike is turning really well, better than it ever has at this circuit but we just need to improve the rear to get it better on the exit to have that traction and transfer. It we get it closer we should be there for the fight." Stoner told MCN his grip issues were not related to Ducati’s previous pumping issue as several times on TV his factory Ducati GP9 was seen bucking and weaving under hard acceleration. He said “On the slower circuits I thought it would be worse coming out of the hairpins but on these faster corners it seems to magnify the problems and we can't grid of it. "The bike was moving because we come out of the corners sliding and then we find a little bit of grip. "Then it wants to spin and then half grip again so it’s not the same old pumping problem. "The old bike pumped quite a lot but also had a lot of grip, which is why it generated so much flex in the chassis and that's why we had a very good bike for this circuit in the past. "But now we've fixed those problems for other circuits it has made us go backwards a little for this one.